Good chefs know that amazing food comes from amazing ingredients. They turn over produce at farm stands looking for the tomatoest tomato. Or the potatoest potato. Quality is the number one ingredient in remarkable restaurants. However there’s another unwritten rule of culinary wizards. 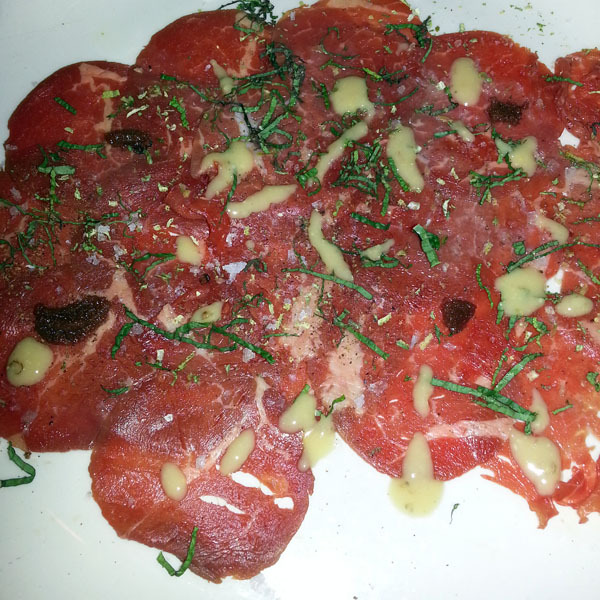 Despite the name, carpaccio is an ultra simple dish: shaved, raw beef. It made it’s first impression in Venice Italy. Named for a famous painter, its is the presentation of raw sirloin, olive oil, lemon juice with either shaved truffle or Parmesan. No heat required. Ever experimenting Tom Douglas twists this dish in his Seattle eatery Palace Kitchen. The foundations remain precisely the same. However he has been playing with culinary synonyms. Yes the beef is the same. However instead of olive oil, pine nuts have been pureed. Bottarga, a kind of Italian fish roe, stands in for the truffle. Lemon becomes dried lime. And chiffonade mint leaves are the back up singers and not basil. But that’s not what haunts the palate. Juniper berries make kids wince. Juniper berries make gin. Juniper berries make this appetizer sing. Chef Douglas reaches into the pine forest for a bitter flavor that rounds out the umami melody. Lavender, rosemary, juniper each carry a slightly astringent, bitter taste. Of course they each boast high tones of herbaceous, comforting aromas. But what makes them fascinating is the fact they are distant cousins to turpentine. Like Harley bikers dressed up in tuxedos. 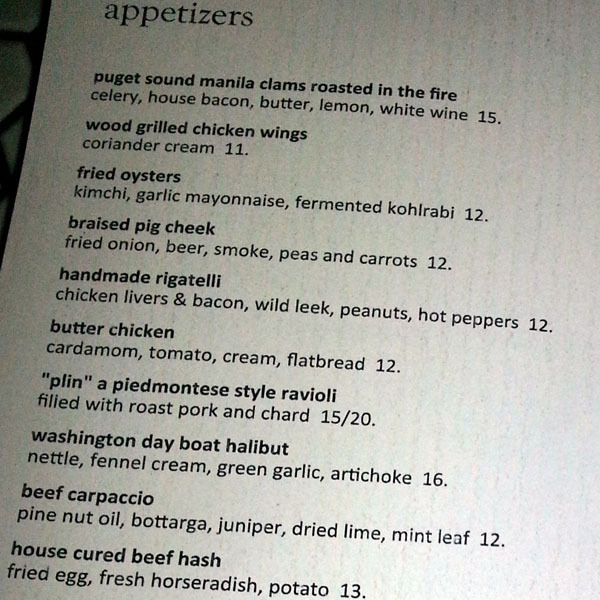 That addition of juniper supercharged the carpaccio. It went from being good to great. It went from an tasty beginning to something worth talking about. Herbaceous and bitter created complexity and intrigue. What do you think? Have you seen this before? Drop us a line in the comment field. To be very clear, I LOVE Carpaccio! First of all there is raw meat that is thin and tender and melts in your mouth like a warm piece of chocolate. Often there is wonderful bread, and if you are lucky, a wonderful wine. What else needs to be said?